Obviously I have a soldering iron - mine is a Weller (can't recall the power but about 45W) and not the cheapest. The tip is still in good shape after several years of abuse from me. The little pot is a tinning compound. Solders: I like Carrs and mostly use 145 degree C (orange packet). If I need to solder someting to a part that needs two solder joints, I use 188 deg. C (green packet) first and 145 deg for the second join. There is less chance of the first bond coming adrift. Flux: I like Carrs Green label (dilute phosphoric acid) for brass and nickel silver. There are several sources of soldering supplies, Carrs is available from: http://www.finescale.org.uk/index.php?option=com_virtuemart&Itemid=56. Also check out: http://www.dccconcepts.com/index_files/DCCsolderfluxes.htm These are well regarded from what I've read but I've never used them. I have never found a good source for brass modelling solder and flux in North America - possibly because brass kit building is pretty rare here (I wouldn't mind being corrected on this). The keys to successful soldering: The right tools and materials, hot iron with clean tip, clean surface, lashings of flux, a drop of solder on the iron tip and then in and out. There should be a fizz and the solder should flow readily. Some may disagree but the regular electrical rosin cored solder is not suitable for this job. (On the other hand acid flux should NEVER be used for electrical work). I also don't like lead free solder - it doesn't seem to work well, for me anyway. I think the thing that puts a lot of folk off soldering is the fear of burnt fingers. Well, not to worry, you will burn them but not with any kind of severity (so far I haven't - I've done far more damage with knives). It's wise to hold parts with something other than your fingers when soldering but sometimes it can't be helped. It's amazing the speed of the heat transfer - just grit your teeth. Spring loaded pliers are useful for holding parts as are tweezers. The yellow pack is a set of broaches - invaluable for enlarging etched holes. The good old Olfa knife is a fine general purpose tool - useful for cutting parts off the etch. Next to it is a propelling fiberglass pen - very handy for cleaning and burnishing. There's also a steel rule, large file (with a dead edge) and a very fine file (red handle). I'll use the scriber to push out half etched rivets. As can be seen, it is one sheet of etched brass. The parts are cunningly and artfully laid out. The instruction sheet runs to four pages of exploded views with very few words (ideal for us guys). The kit includes some steel spring wire, steel buffers, and something I've never seen before - 3D printed axlebox/spring and buffer shanks. You will need to source wheels, paint and transfers. Hornby, Bachmann, Markits, Alan Gibson, Exactoscale (EM or P4 only) and Ultrascale all do wheels (3' diameter or 12mm on the tyre, 8 spoke ). I've listed the wheels in more or less ascending price and quality. I am using Markits wheels (at least I think they are - they were in my wheels box). The first thing to do with these is to push out 8 rivets per side with scribe. It's seem better days and is not especially sharp. There are actually 2 folds to make. Folds made. At the base of the solebar is a narrow ledge that is formed making a bend in the etch. This was surprising difficult to do and I really should have scored the fold line better than I did. I tried to use the steel rule as a bending bar but it wasn't very effective. To join the two halves of solebar together, I tinned the inside surface with 4 small drops of solder. I then folded the solebar. Because of the small ledge I used the steel rule to support the piece. I applied some flux to the INSIDE of the sole (not the side with all the detail) and ran the soldering along it starting at the center and working out. The small file is useful for pressing the two halves together. There should be a hiss and you will see solder just showing itself as it flows. Lastly, in order to straighten out the ledge I pressed the steel rule against it and used the file to complete the fold. You can twitch the ledge with pliers here and there if necessary. I put a small amount of solder under the ledge at each end. I left the middle - it seems strong enough. There are 4 boxes (I don't even know the technical term) (Edit: door bangs) to be added to the solebars. These start out as flat pieces with two fold lines. There's also a rivet to be pushed out. To cut a long story short I used the file (isn't it useful!) as a former and folded the sides around it. Use pliers to straighten things out if required (it was for me). Then, cut very small pieces of solder. Apply flux to the location (there's a raised rib so you can't get it wrong) and place the box. Use the file to hold the piece (easier said than done) and pick up a small piece of solder with the iron. Hopefully the solder will flow and the box will in the right place and straight. In a couple of cases I botched it. Simply heat and remove the part. If there is a lot of solder on the rib, I found desoldering braid useful to remove it. Try again. ﻿There are 4 brackets near those boxes I put on yesterday. Strapping at the base of the W irons and spring snubbers. Strapping was relatively straightforward - I tinned the back of the straps while still on the fret. When removingthese (and all parts really) try to reduce the etch tag. I still had to file by holding the part in square nose pliers - a fiddly job in itself. The brackets fold up and there is a tab that goes in slots in the solebar that is bent over. The bracket is still loose. I found the best thing is to position the bracket as close as possible and to get a dab of solder on the tab at the back. Then using needle nose pliers, hold the bracket from the front and apply the iron while tweaking the bracket. 1) Take down the etch tag by gripping the (oh so tiny!) piece in flat headed pliers and filing off with fine file. 2) Make the end bends first. Reinforce these with solder. Then using a piece of waste fret (about the right thickness I found) as a form, push down on both legs trying to exert even pressure. With the bent piece balanced on the edge of the fret, finish the bend with needly nose pliers. I found, with a bit of practice that I could make a reasonably square looking "hat". I actually managed to lose one of the top hats but I used a piece of square tube as a standin. Put the top hat on the work surface and place the solebar over it. (Edit: If the W iron is too narrow, use a file to make it just wide enough to accept the snubber). Hold the snubber with a small screwdriver and apply the iron. File off the excess. I probably spent a half hour on my hands and knees looking for pieces that flew on the floor. There really should be spares on the fret. Next step is to assemble the floor and solebars. Refreshingly, there is nothing special about this and all went together easily and squarely. (Edit: The inner ends of the solebar will slightly foul the buffer housing holes. File a slight taper on the inner ends and rebate with a circular file. The buffer housings are quite fragile so best to avoid handling these as much as possible (I broke one)). A note about solder control. I find it better to cut tiny amounts of solder off the roll, flux where I want to join, place the solder and apply the iron. It's difficult to control how much solder gets on the tip - usually too much and we're resorting to desolder braid. The next step was to do the brake gear. The brake mechanism is only mounted on one side of the wagon. The brakes are a double thickness fold up, with brake shoes and crank sandwiched in between. This, as usual, is a tad fiddly. First, I tinned the brake shoes. Then, I put the shoes in between the two halves being careful to position it correctly. Use a convex file to get the curved profile of the brakes. Application of the iron causes the solder to flow and for the parts to be bonded. I positioned the brake assembly, first tinning the underside. I made sure of the position by threading the supplied wire through all the holes. Use a broach to open holes that are too small. Next is the fiddly job of positioning the crank so that its' hole lines up with rest while threading the wire through everything. Once everything is in place, a few dabs of solder will secure everything. The brake ratchet is next. There are several folds but I managed to break them. Fold the ratchet so that the loop is about level with the bottom of the W iron. The instructions are vague on this point. The brake lever is simply threaded onto the wire. It has to bent in a few places to clear solebar details and I shortened mine slightly. I did all the bends in situ. The end of the lever should be parallel to the solebar. One thing I forgot to do before taking the pictures above was fit the safety loops around the brake rodding. There are two pieces of flat etch that are supposed to bent and soldered in place roughly halfway between the shoes and actuator. I felt these weren't quite long and were too flimsy. I opted to drill two holes and bend up some 0.020" wire. There three main pieces - the body and two ends. First order of business is to push out the rivets. A word of caution, if you plan to use the horizontal strapping, you don't need the rivets in that location. I had to file them down. The top lip was bent using the jaws of a vice. It sort of works but the jaws don't close evenly so I didn't get an even bend. I tweaked the bends with flat head pliers. The top lip on the ends was made with the pliers. Put the coupler plate on while everything is still flat. Tin the plate, locate and apply the iron. (The liberal use of flux is implicit throughout this - nothing will work without it). Next use the same process with the vertical strapping and horizontal strapping if required. Now fold up the main body until the sides are at right angles. The ends of the vertical strapping should be soldered down to the underside of the body. Make side folds in the ends and apply solder to these. Trial fit them to the body, file down the solder if necessary until the end goes in - it is very snug. Make sure the corners are square and apply the to the tab. By the way at each stage of construction I've been cleaning the work. I also use a fiberglass pencil to remove stray solder. Now the exciting bit, trial fit of the underframe and body. It's looking good at this stage I think. I added some additional detail today and got the wheels installed. The first thing to note is the coupling hook. 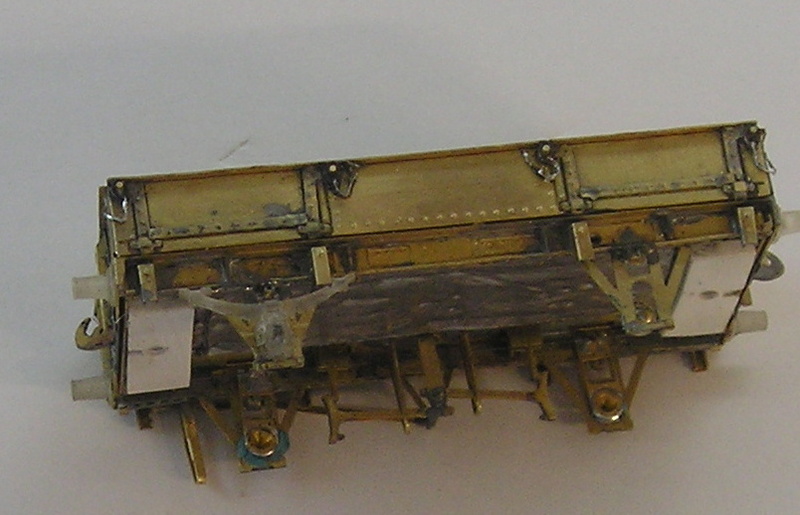 Straightforward fold into double thickness and solder into the slot on the bufferbeam. The buffer housings are 3D print. I had to do some fettling to get them to go in. Secured with superglue. I did a trial fit of the buffers, lovely steel things. The kit includes springs for these but I can't see how I can get that to work - there's just no room. This wagon is sprung. There are separate bearing holders which thread onto a length of steel wire. The ends of the wire slot into holders and the bearings slide up and down in the slot in the W iron. The wagon is very free running and smooth. Couplings must be given some thought. There are many choices and I've had a look at most if not all. The best looking coupling would be prototype 3-link. However, this is a non-starter because getting wagons coupled and uncoupled is just too difficult. My compromise, made more than 20 years ago, is to use Kadee couplings. Most RTR vehicles today come equipped with NEM pockets and these can be purchased separately. For me though, I prefer to use Kadee #5 for this job. These are easy to assemble and fitting is straightforward. More on this later. Cut to length, and put a notch in to cleat the back of the coupling hook. It might be better in hindsight to snip off the back of the hook. I then located the coupling to length by eye (I've done this loads of times) and by referring to a dry fit buffer. The buffer head should be even with the middle of the knuckle. Holes were drilled and then tapped using the Kadee tools. The excess screw can be easily snipped off and filed flush to the plastic strip. Next, I want to confirm the height. Temporarily fix the coupling assembly with blu-tack. This time the height is spot on. I'll now glue the coupling base into the wagon, but leave the Kadee off until after painting (paint will clog the fine spring in the knuckle). Other things to note are the coupling mounting pads and lead weight. Even after adding weight, the wagon only tips the scales at ~ 30 gms. The other job for today was to make a start on the axleboxe/springs. These are 3D prints. My first though was to have the pinpoint bearing slide up and down inside the axlebox - there is a slot. However, the slot is much too small and I didn't fancy machining a larger slot since the risk of wrecking the part was high. Instead, I used my Dremel to enlarge the hole so that it would fit over the pinpont bearing and then cut off the spring. The spring and axlebox were filed flat at the cut. The spring was secured with super glue on the W iron and reinforced witha couple of dabs of contact cement at the spring fixings on the sole bar. I then...very carefully, applied a dab of contact cement to the head of the bearing and inside the axlebox hole. In the picture, you can see the Dremel bit I used to open the axlebox hole. A pinpoint bearing is shown for comparison and two axlebox/springs also shown. The one on the left is as received, the one on the right has had its' hole enlarged and spring cut off. The wagon shows the axlebox and spring assembled to the wagon. I realized late yesterday, after I had cut up the kit axleboxes, that I had used shouldered bearings instead of waisted bearings. Shouldered bearings are too wide for the axlebox slot. 1) removed the axlebox/springs from a Slater U/F kit solebars. (Not GWR standard I know, but given these wagons had an 80+ year lifespan it's possible some received RCH ones - anyway that's my excuse and I'm sticking to it), These were thinned and the bearing hole enlarged. 2) removed the shouldered bearing and installed some waisted bearings that I robbed from another kit. The wagon runs well after all that - I still have to glue the axleboxes on. I have now glued the axleboxes in place using superglue. Double check at this stage that the bearings fit comfortably. If required work them a bit more with Dremel. Now, with the axleboxes glued on the W irons stiffen up so that the wheels are no longer as free running as before. I actually got some solder in one of the bearings. My solution: the Micro Mark Truck Tuner, http://www.micromark.com/HO-Truck-Tuner,8241.html It's designed for plastic bearings but it does a good job on brass ones as well. After a few seconds of twirling the tuner while gripping the axleboxes tightly opens the bearing enough to get the wheels running freely. The buffers need some attention next. These are turned steel and very fine. CAUTION: When opening the packet note that there are VERY SMALL spings included. Be VERY careful because if they fly across the room you will probably never find them again. That's a scary looking bottle. I primed (red oxide car primer) the wagon last night. This morning I applied acrylic Engine Black from Polly S.
I also installed the buffers. 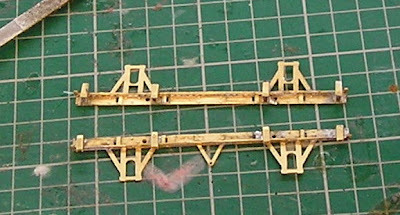 Now, these are intended to be sprung but I couldn't see a way to secure the buffer shank behind the buffer beam, so I simply super glued them. For the operations I do, with Kadee couplers, buffers don't need to be sprung. One way I think it could be done is to install the buffers into the housings BEFORE putting them on the buffer beam. The end of the buffer shank can be bent over or, use a small slice of fine wire insulation. Perhaps next time. ﻿The paint will tend to clog bearings and bearing carriers. Simply work the mechanism until it loosens. Later on these will be oiled. Use Micro Sol to make sure the transfers are well stuck down. This will seal the transfers. Finally, weathering. These wagons had lives in excess of 80 years, being first introduced into service in the last decade of the 19th century and surviving well into the BR era. I wanted to depict mine as it might have looked around 1960. I started by getting some red brown paint and rusty coloured powder. I painted a thin line at the top lip of the wagon and then, while the paint was still wet I put some of the powder on. I then gave the mix a downward brush. I repeated this at severallocations. I also simply applied rusty powder over other areas, especially inside. The rust effect actually came out heavier than I wanted so I removed some of it by painting on some IPA and dabbing with a towel. Next, with my airbrush I gave the wagon an overall spray of dirt, followed by a light spray of black. I completed the effect by mixing black and white pastel into a grey and streaking the sides and ends (very subtle this). I highlighted the door chains with a silver brush and painted the brake handle white. I am very pleased with this outcome. Having thought about my lettering I decided I didn't like it. For one thing the number isn't straight and for another the lettering on the right hand side doean't ring true for an ancient wagon. I decided therefore to have a go at making my own transfers. I obtained some Microscale Trim Film, both clear and white. This is supposed to be suitable for laser printers. I made a powerpoint file of the numbers and letters I wanted, having to print it off on paper a few times to get the size right. I then put a white sheet through the printer (I needed white letters). Well, I was able to get some usable transfers but I think the internal heat of my printer is too high because a lot of the print smeared. Now this is a much better result﻿ - a keeper. I finished the build of my second wagon in about 8 hours, over the last couple of days. I painted, lettered and weathered it today.﻿ I don't think there was any hard and fast rule about lettering. I saw a picture of a wagon with the lettering as shown on the left. I've also seen the number without the DW. Weathered Class 23 "Baby Deltic"
Copyright of BMRCM. Powered by Blogger.